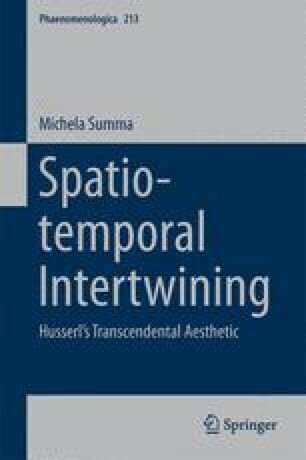 In this chapter, the stratification and the analogies between spatiality and temporality are further discussed in relation to the constitution of the spatio-temporal thing. The stratification in this context can be traced back to the foundational relationship between the constitution of res temporalis and of res extensa. The analogies concern specific aspects of the constitution of the spatial and the temporal thing. It is argued that such an inquiry is based upon an abstracting procedure that aims at isolating, for the sake of description, the spatial dimension from the temporal dimension. The outcomes of the present chapter further emphasize the limits of a mere analogical and parallel account of spatial and temporal constitution. First, the claim that we can properly consider temporal objects apart from their spatial localization is questioned. Secondly, it is argued that the constitution of the spatial thing implies temporal syntheses, so that, whenever abstracting from temporality, we can only provide an incomplete description of spatial constitution. Thirdly, the abstracting procedure does not allow us to account for the constitution of tridimensional space. For, being based upon movement, this constitution requires both spatiality and temporality.